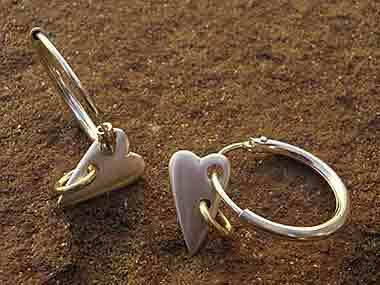 HEART EARRINGS : BRITISH Made : LOVE2HAVE in the UK! The BEST! Quality British handmade stud, hoop and drop heart-shaped earrings all handmade in the UK at prices you can afford. Our UK made heart shaped jewellery puts the love into Love2Have and love is all that should be on your mind when browsing this section of our site. Here we have a beautiful selection of handmade earrings that all feature heart-shaped centrepieces as part of their designs. The main pieces featured here are our lovely and exquisite coloured glass hearts in woven silver or gold cages. Yes, love does come in many colours which is why we are confident that you will find something here to buy as a gift to let her know how much she means to you. We also have gathered together some other designs all made in solid sterling silver in various styles, and unlike anything, you will come across on the high street. They range from quite stylish drop earrings to some contemporary hoop styles and studs, so there is something for everyone. Not only that, but all the jewellery on this page can also be bought as a set too and you will find perfectly matching handmade heart bracelets and silver heart necklaces also listed in this section. We may even be able to offer you a discount if you want a complete set, so do please email us first before you buy.